An exciting challenge for us glassmakers: the glass for the crib roof is first poured into a flat mould and then curved on a cast iron cylinder. The result is a true masterpiece! 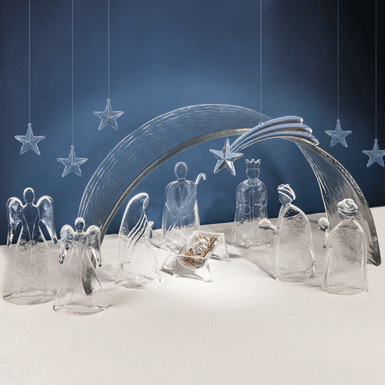 The crib roof large with all the figures large and stars large as shown in the picture costs CHF 1´178.00. Each piece also sold individually… or more conveniently: you can call us and order the whole crib. hot glass poured into the mould and shaped.